Who/What is the Game Maker for? I’ve obtained permission to use copyrighted material or intellectual property that I don’t own, can I publish my game? This handbook looks to take you through the process of creating a board game completely from scratch, using our Game Maker. We will cover a wide range of aspects that go into making your game and how to effectively use our platform to accomplish this goal. Whether you are a casual hobbyist looking to make your ideas a reality or an experienced game maker with the next best idea, the Ivory Game Maker is for you. It’s almost impossible to tell whether a game will ever sell more than 5000 units. The problem is a lot of manufacturers require a minimum order of 5000 units. So before even knowing whether your game is a hit you have to invest proportionate amounts of money, for the everyday person this is not an option and even for large company sometimes the risk just isn’t worth taking. The Ivory Game Maker gives you a platform to create fully customised board games with no minimum order amount whatsoever. No matter what your situation is, perhaps you are a professional game designer or indie developer looking to sink your teeth into your latest prototype? Or maybe you are just creating a private game for friends and family? You could create an incredibly entertaining game made for family gatherings, a stag do or even as a great wedding gift! Board games aren’t limited to simply fun past times; they can be used as incredibly effective education tools. Teacher and Coaches alike can create games to create active, engaging and incredibly social learning tools. In using the Ivory Game Maker you also retain all copyright and intellectual property. For more information regarding copyright check out the copyright page. The Game Makers is mainly directed as hobbyists and prototyping and as such we don't really do bulk orders currently. In order to effectively create artwork and personalise your game components, an element of design wit will be required. This means being partially familiar with some form of vector/graphic editing software. Ivory works mainly with Adobe Illustrator. Although the Game Maker is mobile friendly we strongly encourage game building to be done on computers as some things such as editing artwork are far easier with a mouse and keyboard. See the resources section for a comprehensive list of tutorials on these 3 softwares. Before diving in and bringing your board game to life, it’s a good idea to spend some conceptualising and really thinking through your game. How will your game be played? What will it be about? i.e recurring themes/characters ect. Does my game work? i.e does my game make sense? What components will my game require? Once you have answers to these 5 questions you are more than ready to begin creating your board game. Select create new game and choose a name. Start adding the necessary components simply by selecting add new component. Arrange your components (what cards go in what box ect.). Edit, make changes and rearrange accordingly. Approve all game component artwork. Agree to the terms of conditions and confirm you are the holder of all copyrights. Throughout the Hand Book we will cover all ten steps. Simultaneously the easiest and most difficult part of making a board game: naming it. Simply choose a name and hit Create Game. And so it begins.. Welcome to your game hub, this is where all the magic happens! From here you can manage components, upload artwork, sort out your publishing page or just hang out for a bit. Printable Product - you can personalise these components and put your artwork on them - things like cards, game boards and boxes. Standard Product - things like a game pieces, dice or anything that cannot be printed on. Adding components is easy, simply click the Add Item to Game button at the bottom of your game hub. You can click on the name of a component and it will bring up information about that component, including templates, images and such. You can also control the quantity of standard game pieces from here. So what cards go in what box? You decide! To move a component into another component simply press and hold and drag the component below and to the right of the component you wish to store it in and it should snap to below an slightly to the right of it. NOTE: if a component can not be contained within a product it won't snap. If that doesn't quite make sense see the video in the introduction as it shows how to effectively arrange an entire game. Depending on how familar you are with design this part of creating a game will be either the most intriguing, creative aspect or the most mind boggling. All printable products give you the opportunity to make your mark on your board game. Please see the requirements section along with the resources page for our recommended softwares to use, along with tutorials to familiarise yourself with them. First of all lets grab the correct templates for the component you wish to design. You can find all the templates you need on the components page, there are multiple ways of getting there but for the sake of this tutorial in your game hub click the component you need a template for and click add artwork > then click the link under Findout More column. You'll then find the templates on the right hand side of the component page. 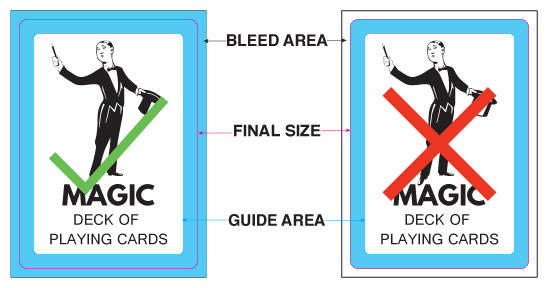 Bleed Area: Any backgrounds, borders or images that don't stick to the blue/guide area need to bleed off this means using the bleed area (usually green). Final Size: The final size of the component. Guide Area: The important element. All text and images that don't bleed off need to remain within here. In the above example the image and text are too close to the final size of the cards in the wrong version. In the above examples - the incorrect version has a border with no bleed compared to the example on the left which has more than enough bleed to insure the final product is perfect. For more information please see our Artwork F.A.Q for further details. Ensure all artwork is using the CMYK colour space. We print soley in CMYK and supplying CMYK artwork will ensure no dramatic colour changes occur. Make sure all images are a minimum of 300 ppi (pixels per inch) and aren't blurry/too small. However more than 600 ppi is unnecessary and not recommended as it does not increase the quality any further. If the artwork is for playing cards, check to ensure you have created a complete set and supplied the artwork in the desired order. All elements are aligned to your liking - central alignment is the way forward! Ensure all artwork is saved in .PDF format. Please outline all text where possible. Please ensure all artwork is supplied with all templates and explanation layers removed/turned off. Now that you are ready to upload your artwork simply click add component on the component you wish to upload artwork for. You can either upload multiple .PDF files or if you have something like Adobe Acrobat that can make multipage .PDFs use that to make just one file (ordering the pages face > back > face > back in your desired order will ensure cards are in order automatically). Once the uploader has accepted your files (it will reject the file if the dimensions, format or file size are wrong) it will begin processing. How long this takes is dependent factors such as file size and how many pages are in your PDF but is usually pretty quick. To edit artwork click edit artwork under the game component you wish to make changes to. The tools under the edit section are predominantly used when designing cards however they can be very useful for other purposes also. Rearranging Cards: To rearrange cards click and hold on the card you wish to move about, to swap the face or back of one card, simply swap them around by clicking on that cards face or back and moving it over. Duplicating Cards: to duplicate cards simply hold CTRL and drag the face/back into a new slot. Item Name: You will notice at the very top you are able to choose a name for your component, this is particularly useful if you have multiple instances of the same component. Zoom Bar: Drag this left and right to zoom in and out. Use this to give you a better overview of your items or zoom in to get a closer look on an individual item. The Stack Tool: This is the tool used to rearrange items and is particularly useful for cards where the order might be critical to how your game is played. Add All Stacked Pages: Distributes everything held by the stack tool across the cards. Save: Don't forget to do this! Prior to making your game all component must be approved. To do this simply click on a component and hit proof. Show Proof Lines: Clicking this brings up the magenta proof line. This line indicates shows final size of your product. Show Check Lines: This will bring up an additional cyan line, known as the guide area. All text, images and general content needs to be contained within this blue line. If it is not, you are at risk of running into problems when the cards get cut. See our Artwork F.A.Q for more. Prior to approval you can edit, reupload and make as many amendments as you see fit. The bleed is the part on the side of a document that gives production 3mm space to account for movement of the paper and design inconsistencies. Background colors should extend into the bleed area. 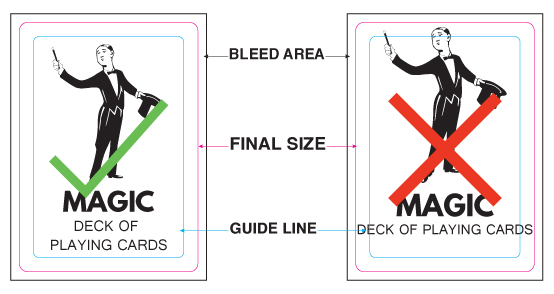 After cutting, the bleed ensures that no unprinted edges occur in the final product. What file types do you guys accept? Due to the ability to edit your files on our site the GameMaker currently only accepts PDF’s. My artwork contains images/text that is quite small, how can I guarantee that it will be printable? Do I need to use the templates? Short answer: yes. The reason we recommend the templates is they are already the correct size and contain all the necessary guidelines required to produce the best artwork possible. I went to proof my artwork and the colours look different! The proofing system proofs in RGB due to the nature of the web. So when CMYK artwork goes through the proofing system it tends to look slightly darker, all artwork is printed in CMYK however. Now that you have completed your board game the next step is entirely dependent on your needs and what you plan to do with your board game. For example if your game is for private use or purely for prototyping purchase all you need to do is add your game to the basket with however many you wish to purchase - you do not need to create a publish page. If you plan to sell your game in our shop you will first need to create a publish page and purchase a sample, this is to ensure that you are happy with the game and that it plays well and makes sense. Dependent on whether you go for purchasing or publishing will depend on which checks you need to meet. If you are buying for yourself you only need to pass the Checks For Buying Your Game. If you wish to sell you will also have to meet the additional checks. All the checks can be tracked via the right hand side of your game board creation hub. Items in Game: Never was a board game made out of nothing! 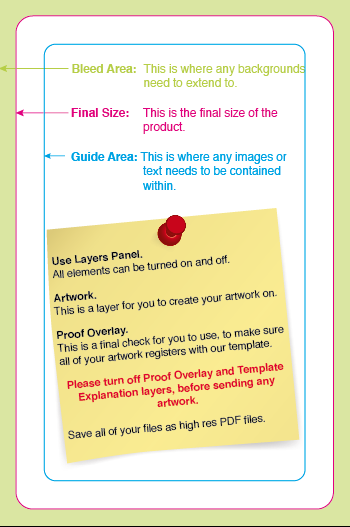 Printable Artwork Approved: You need to sign off on all printable artwork. Agree to All Terms and Conditions: You confirm you agree to our terms and conditions and that you are the holder of copyright and intellectual property. For more information on this please see our copyright page. Although you can start creating your publish page right from the start, prior to your game being added to the shop you must first pass the Additional Checks For Publishing Your Game. Game Sample Purchased: Before your game can start to be sold on the shop you will be required to first purchase a sample of your game. Game Sample Approved: Upon receiving your board game, we encourage you to test the game to make sure it plays well, thematically make sense and ensure that you are happy with the general quality of the product. Once you are satisfied you then mark the game sample as approved. 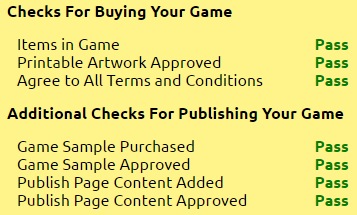 Publish Page Content Added: This is just a check to ensure that if you intend to sell your game on the shop, you've actually created content for the publish page. If you plan not to sell your game on the shop you do not need to pass this check. Publish Page Content Approved: Before we list your game on the shop we need to approve the content you have wrote. We check to ensure all content is appropriate and meets our necessary requirements. If you plan not to sell your game on the shop you do not need to pass this check. Write the content for your product. Decide things such as the game genre, play time, age rating and minimum players. Banner, logo and pictures that will be added to your games slideshow. This section will break down the individual elements on the publish page. Insert Link: Adds a link to the page, good for linking to your games website for example. All links will be checked by a moderator before publish page approval. Insert Image: Inserts an image, you can choose the alignment of this image as well. Undo/Redo: Implement or redo a previous change. Game Short Description: A brief 140 character description of your game. Game Genre: Select the most appropriate genre/theme for your game. This will be used when users search for specific genres on the shop. Play Time: Estimate the time required in order to play your game. Age Rating: Decide the age requirement to play your game. Take into account the genre, complexity and appropriateness of your game before selecting an option. Sale Markup: Decide how much profit you want to make per sale. Production Price: This is the price one board game costs for us to produce. Markup: The sale markup you set previously. Your Commission: How much you will make for each sale of your board game. 70% of the profit. GameMaker Commission: The remaining 30% of the markup price the GameMaker collects. This contributes towards further development of this complex system and enables us to look to expand our range of products and capabilities. Save: The Save button saves the current version of the publish page and updates any sales elements based on the markup you enter. Preview: Gives you a preview of how your page will look when it is on the Shop. Submit For Approval: Submits your publish page for approval. The GameMaker staff then goes through and checks that everything is appropriate and good to go. You will receive an email once your game has been approved. Page Last Save: Keeps track of when you last saved your page - make sure you save before exiting! Page Approval Requested: The date your approval request was put in if one was made. Before you publish your game it is vital that you are legally able to use everything in your game, be it images, content, themes and even the game itself. For example you cannot make a direct replica of an existing game, e.g. Monopoly™. It is your responsibility to ensure that everything in your game is owned by you, even if your game is intended for personal use. Who owns the rights to my game? Simply put: you. Through using our game maker to publish your board game you retain sole ownership of any copyright and intellectual properly. Prior to publishing we will need to verify with the original copyright holder that you have obtained permission to use their copyright. Email gamemaker@ivory.co.uk with both a copy of the granted permission and the copyright holders contact details.